I'd been having issues with my regular mascara flaking during the day. As a contact lens wearer this can be frustrating and uncomfortable. I have decent lashes but they are pretty straight, so using an eyelash curler is a must. The issue is usually regular mascara doesn't hold a curl long and waterproof mascara can be harsh for my lashes. 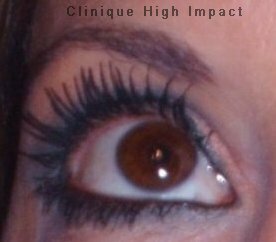 I researched Clinque Mascara online and like that it was hypoallergenic and ophthalmologist tested and decided to try it. I'm very glad I did. The formula isn't clumpy and I like the large brush. It held a curl very well and didn't flake at all! Will definitely purchase again! I purchased this solely because it is one of the few remaining cosmetics brands offering black-brown mascara. For that reason it is great; a nice black-brown that doesn't look too severe as most black mascaras do. The brush is also nice and the formula has stayed fresh even after several weeks, but I am disappointed in the lack of length and volume. I don't get a "high impact" result with this, and will probably go back to L'oreal Voluminous after finishing this. I usually try a new mascara every time I need one. I think lash paradise and L’Oreal voluminous are the only mascaras I have repurchased recently but I will definitely repurchase this. This is one of the best tubing mascaras I have tried - no smudging, no fall out. It lengthens and separates lashes really perfectly and doesn’t clump much. I love it. It does dry out a little faster than non tubing mascaras, still worth it. Perfect mascara for your bottom lashes! This particular mascara has a tubing effect,so it makes removing it easier.Mascaras tend to smudge on me,but this one stays in place.I will usually use it after my Buxom Big Tease mascara to kinda seal the mascara.I do have very short and straight lashes,but this product gives me the length and volume I need to create contrast between my eyeshadow and lashes.Wore it for 8hrs straight and still looked good as new!Not waterproof. I am a fan of this mascara. I have thin lashes. I did receive it in a gift set when I purchased a foundation and put it away for quite awhile. I finally started using this when I was finished wit a CG mascara and was surprised. I've tried this with a primer and w/o. I don't see any difference which makes this a mascara I would use. The mascara doesn't smudge yet is so easy to remove w/o tugging at the skin. So I'm a fan. Now if Clinique would not include some awful lipsticks/colors in those sets. But that's for another review. Makes my eyelashes look great and works well for sensitive eyes. I used the black color. I'm so sad to see that i'm the exception here who actually loves this mascara. I find this mascara great for everyday use. It provides great length and volume for everyday wear. It has a nice black colour which isn't dramatic. It removes easily with my Bioderma Cleansing Water. Does not smudge either and it's economical when compared to Dior, Chanel, YSL, etc. I will repurchase for sure. If you want drama - dark, rich black pigment with alot of volume and length plus helping it stay curled all day - try the Chanel Revolution Mascara. I LOVE THAT! It is my HG! I will warn you though that it does smudge if you don't wear powder underneath the eyes. And after washing I am still left with a tad bit of the mascara smear under the eyes; hence I only wear this for special occasions. Cannot be bothered with the high maintenance everyday. This is a very strange product. I've purchased the full size on several occasions, but if you can, I would much rather recommend the smaller mini/sample sizes that are frequently offered with GWP, holiday kits, mascara sets, etc. I'm not sure why but the full size does not perform anywhere near as well as the sample size, almost to the tune of a being a completely different product. I don't understand if it's the amount of air that gets in the tube or how it dries out or what, but I've had other people tell me the same, completely unprompted. The mascara doesn't live up to its name. No high impact here. On the bright side, there are the facts that it doesn't flake and it's easy to remove. But there is no length, no curl, no volume, irritating for my sensitive eyes, and difficult to build up.